Furukawa Art Museum in Nagoya, Japan is celebrating its 25th anniversary with a unique, interactive exhibition featuring a collection of Nihonga paintings from the early 1900s to today. The term Nihonga (literally translated “Japanese-style painting”) was coined in the Meiji Period to distinguish Japanese painting from Western-style painting, which was gaining a lot of (unwanted) interest during that time; however paintings in this style had been created for hundreds of years before the title was introduced. Nihonga, at the time was re-invigorated, ensuring a continuation of traditional painting, preserving the strength and longevity of this distinctive Japanese art; however it can be argued that modern-day Nihonga has moved far from its heritage. Nihonga painting fascinates me; the process behind preparing the paint is ritualistic and almost a form of mediation – not unlike a Japanese tea ceremony. You can’t just get your palette out, squeeze out some paint and you’re ready to go. Medium is derived from raw materials, including minerals, shells, precious stones and coral and then ground into 16 different textures, from sandy grain to fine. Nikawa, a glue made from animal hide is then mixed and used as a binder for the pigments. Water is also added and then the mixture is left to harden overnight, or for a few days. Using the paint can be likened to watercolour. The colours are painted over and over again and according to the quality of the ores, the tones change. White is created from cured scallop, oyster or clam shells and needs to be ground for at least fifteen minutes to create a smooth, matt texture. It is then mixed with glue, and kneaded and rolled into dough-like sausage and kept in the refrigerator for extended use. Another characteristic of Nihonga is that it is painted on washi (hand-made Japanese paper) or silk. Here I am making some washi paper and taking it very seriously! Features of a Nihonga painting can be simple expression (no photo-realism), limited shadow, use of pale colours and outlines. Another reason why I am drawn to Nihonga is that the works often express a simple moment in time – the works do not require you to try and understand what is happening in front of you – the raw beauty and simplicity of a moment in nature is there to just sit with. Motifs are enlarged against a shallow or unfigured background and there is little concern with movement or spatial depth. Whether it be a fat, fluffy sparrow sitting in a plum blossom tree during winter, or a woman admiring the deep red leaves changing on a Japanese maple from her window – these images appear in a frame of immeasurable duration because there is nothing to mark the passage of time; the moment stretches on for as willing as we are to contemplate. Now that we have an appreciation of how Nihonga paintings are created – let’s move to the exhibition! It featured birds and flowers and of course the revered four seasons in Japan. The exhibition was over two floors of the modest Furukawa Art Museum in Ikeshita, and was the first interactive art exhibition I had been to. Each painting that depicted a bird was accompanied by a red dot next to the title, which you could press with a little device given and the bird call would sound! So as I was walking around admiring these incredible paintings of nature, I would hear the occasional bird call, which was very moving and so delicately balanced with the exhibition. After living here for a while now, I could only articulate this experience as “Japanese”, accompanied as it was, by a warm feeling inside. The exhibition encouraged the audience to go bird-watching, and cherry-blossom viewing, “while thinking of the excitement of the painter when they found the flowers and birds in nature”*. I am unable to include any of the images from the exhibition; however you can see four examples on the Art Museum’s website: http://www.furukawa-museum.or.jp/show_exhibit. You can see just from these paintings the difference in style – Ryuokashi’s painting has definitely moved away from the traditional Nihonga style. 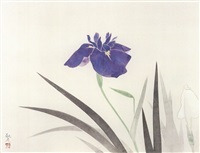 The simplicity of Yasuda Yukihiko’s Iris and Kibo Kodama’s works that were featured celebrate the beauty of nature and provide us with unmarked moments in time for contemplation (please excuse the tiny reproductions). 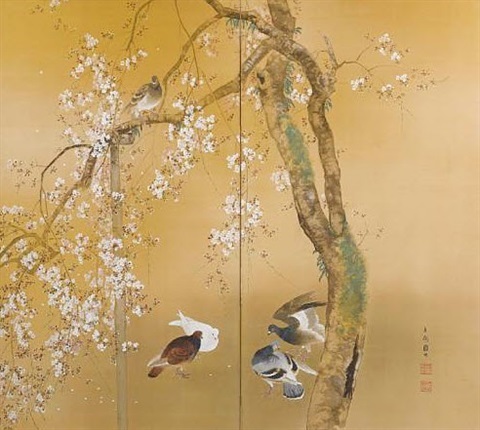 Imai Keiju’s work of pigeons beneath a cherry tree on a two-fold screen also depict the beautiful, brief but unknown moment in time. This was one of my favourites (when have pigeons been depicted so beautifully?). Although the Japanese try to control nature (which is another blog post completely), their respect for nature and reverence for simple, beautiful moments is inspiring – and this exhibition truly celebrated this.